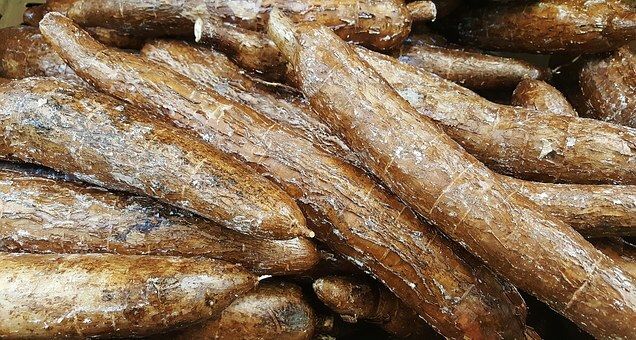 Benefits of Cassava - Who does not know this sweet potato called cassava, I think everyone in the land Water is familiar with the food that comes from this type of tubers. One of the benefits of cassava for our bodies is as one of the body's energy enhancer food. The content of carbohydrates in sweet potato or cassava is quite a lot, so we will feel full longer. Moreover, cassava is boiled it will be a food substitute for rice. Red blood cells are in need of our bodies and cassava can help this production process. The content of Riboflavin from cassava plays a role in the production of red blood cells. In addition, cassava contains a group of vitamins: Thiamin, Pyridoxin , potent acid, and folates. For people with intestinal damage or more called Celiac Patients, consuming cassava is a food that will not add to the damage and may be eaten. And cassava is a Gluten-free food, meaning it is a safe food for Celiac sufferers. Damage to the small intestine is more influenced by foods containing Gluten and will affect bone health, such as Osteoporosis. Our bodies need a source of fiber, one of its utility is for our digestion to be healthy. Well one source of cheap fiber is cassava, can be obtained by buying or by plan ting , then the source of fiber from the type of yams - we can get it. By consuming this cassava, then we can also avoid the risk of stroke, colon cancer, and heart. The habit of consuming cassava is nothing to lose because in addition to the above benefits can also make your bones strong. Because cassava also contains Calcium, Vitamin K and some other nutrients that are essential for bone formation. Especially for bone strength, so not easy to porous. And also very important for the treatment of patients affected by Alzheimer's. If tired of eating cassava in a boiled way, then we can experiment with making it into other types of food, such as sponge or getuk. So this short article is made useful hopefully if there is mistake pad aide and writing I apologize.